In 1972, shortly after I began collecting the works of Edgar Rice Burroughs, a dealer expounded on the value of dust jacketed Grossett & Dunlap editions. He stated that they "would never be worth much." Fortunately, I have collected Edgar Rice Burroughs books long enough to see his statement proved wrong. Unfortunately I have also see the cover price of new Burroughs paperbacks increase to more than the price I paid for those "worthless" Grosset & Dunlap editions in the mid 1970s! The pattern I followed in collecting Burroughs books was probably the same one followed by many of you. Just out of college and married, with a child on the way, money for book purchases was in short supply. No matter how poor I was a visit to the used book stores was made every weekend in search of needed titles. Notice I said "needed" because duplicates did not figure into my collecting scheme. My goal was to acquire one copy of each title. Money was so scarce in those days that it would be a year and a half before I splurged an bought a dust jacketed Grosset & Dunlap edition. As time went by my income increased as well as the scope of my paperback book collecting. Having one copy of each title was not enough. I now had to acquire all the different cover illustrations and this soon progressed to collecting all titles in the various formats. Ace Books was no longer publishing the small size paperbacks that I loved so much. They had increased in size to match the industry standard. 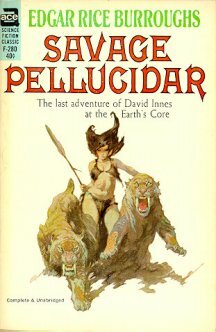 Ballantine Books was publishing the Tarzan series in its fourth format and the Mars series in its third format. (A change in format takes place when the size of the cover illustration is increased or decreased, the spine layout changes or when there is a totally new layout for the entire series -- including the cover illustrations.) Filling in the missing paperback books was a fairly painless process when Ace and/or Ballantine changed formats or printed special editions they would be quickly purchased. Over the next ten years I was blessed with good fortune, and good luck, enabling me to complete my hardback collection (both first and reprint editions) as well as acquire most of the pulp magazines containing Burroughs serializations. By 1986 there was no need for me to frequent the used books stores. Book crawls that took place during the Burroughs conventions and my annual visits with Mike Conran were now boring. This situation had to change! During this collecting lull I noticed minor differences in the "black spine" Ballantine editions. On many editions the color of ink used to print the stock number, cover price, title and/or "Edgar Rice Burroughs" changed from the color used on the previous edition. 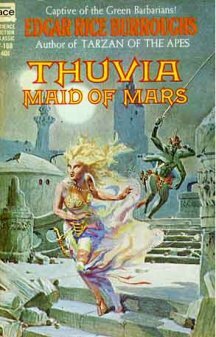 Needing something to fuel my collecting habit I started acquiring editions with these changes, and before you knew it, an all-out assault on collecting every Edgar Rice Burroughs paperback printing had begun. Collecting all Ace Books paperback printings is more difficult than collecting all the Ballantine books printings. Most Ace editions did not provide any printing information (printing number and printing date) and when they did it was not always accurate. While attending the 1996 Dum-Dum in Tarzana, California I met Ace Books specialist Marty Massoglia and form him learned that multiple Ace Books printings took place at the same cover price and using the stock number (like Ballantine Books, however, without the aid of a printing number). To differentiate between the various printings you had to look further and consider the ads in he back of the book as well as the address of Ace Books printed on the title page. The Ballantine Books system of listing the printing number, and until recently the printing date, made collecting every printing easier, however, it is not problem free. I have been extremely diligent in my attempt to collect all printings and yet there are some that still elude me. That in itself is not unusual, but the fact that these same printings have eluded the collections of other completists (and non-completists) makes one question their existence and wonder if Ballantine skipped a printing number or two. 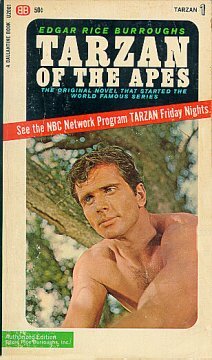 A case in point would include the twenty-first printing of TARZAN OF THE APES published upon the release of "Greystoke, the Legend of Tarzan, Lord of the Apes." 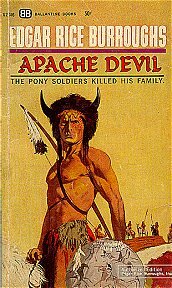 The "black spine" series was dropped after the nineteenth printing and a new format, using a Charles Ren cover illustration, was begun. No problem so far, however, the next printing I located utilizing the Ren cover illustration was number twenty-four. Keep in mind that I was constantly looking for new printings and was in contact with ERB collectors around the United States who were also searching for new printings. In the sixteen years since the twenty-fourth printing I have never seen offered for sale, or in another collection, the twenty-second or twenty third printing. Where are they? Did Ballantine skip these printing numbers? A similar case took place with the release of yet another movie tie-in. 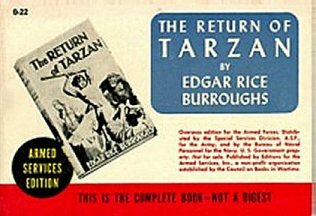 When "Tarzan and the Lost City" was released Ballantine reprinted "the book that inspired the new motion picture," TARZAN AND THE JEWELS OF OPAR. The last Ballantine Books printing of TARZAN AND THE JEWELS OF OPAR that I have uncovered is the nineteenth dated May 1991, and it is also the first in a new format. This new format has a Barclay Shaw cover illustration and is also the first of the Del Rey imprint. 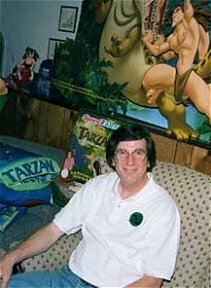 In January 1997 the first printing of Ballantine Books' "double volume" TARZAN AND THE JEWELS OF OPAR and JUNGLE TALES OF TARZAN was printed (also under the Del Rey imprint). The second printing of this "double" was reprinted in late 1997. By this time Ballantine Books' printings were not dated (except for providing the first printing date). They were using the printing number line "10 9 8 7 6 5 4 3 2" or in the case of higher printings "39 38 37 36." 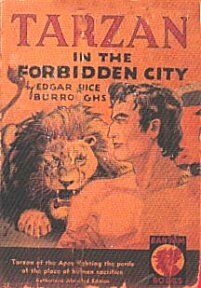 With the April 1998 release of "Tarzan and the Lost City" Ballantine, under the Del Rey imprint, reprinted, with new covers and spine, the twenty-second printing of TARZAN AND THE JEWELS OF OPAR. What happened to the twentieth and twenty-first printing? Part of this question was answered in mid 1999 (almost a year and-a-half later) when the twenty-first printing of TARZAN AND THE JEWELS OF OPAR was released. This printing had the movie tie-in cover used on the twenty-second printing and not the Barclay Shaw cover used on the nineteenth printing. Even though the "double" was a first printing did Ballantine consider these two printings when they skipped from nineteen to twenty-two, or did they realize their error and back-track, making it the twenty-first printing instead of the twenty-third printing? Is there a twentieth printing I am unaware of? Who knows? 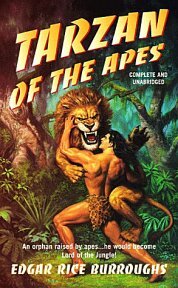 These problems aside, the quest for every Edgar Rice Burroughs paperback book printing has given me an enormous amount of pleasure. After all, I now have something to look for while on those convention book crawls! At this point I was going to provide a basic paperback bibliography. While gathering the necessary information I realized that there are numerous non-standard softcover editions. These might not qualify as "paperbacks" as we know them, however, they are certainly bound in wraps (soft cover). Since we are now in the era of the print on demand or "instant book," it is very difficult to keep up with books being published using this new technology. Therefore this bibliography is by no means complete. If you know of a title (or titles) not listed please inform me of these. 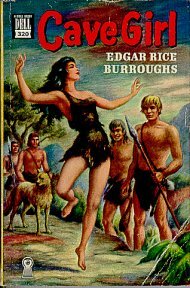 What follows is an alphabetical listing of soft cover Edgar Rice Burroughs book publishers and the titles they have published. also Ballantine Books, Inc. ~ A Division of Random House, Inc. also A Del Rey Book published by Ballantine Books ~ A Division of Random House, Inc., Also A Del Rey Book published by Ballantine Books ~ A Division of Random House, Inc., also A Del Rey Book published by the Ballantine Publishing Group ~ A Division of Random House, Inc.
Carroll & Graf Publishers, Inc. Edition for the Armed Services, Inc.